Alibaba raised $US3 billion to further invest in popular Chinese food-delivery service Ele.me. The e-commerce giant announced earlier this month that Ele.me will start delivering Starbucks to customers beginning in September. Investments in Ele.me may weigh on Alibaba’s bottom line but will increase top line results, said a team of Jefferies analysts. Alibaba is aggressively investing in popular Chinese food-delivery service Ele.me with the hopes of expand its reach into consumer-wallet spending beyond e-commerce. The Chinese e-commerce giant said Thursday that it has raised $US3 billion to further invest in Ele.me and will merge the online food-delivery unit with Koubei, a life search engine, to build its flagship local services vehicle. In May, Alibaba completed its acquisition of Ele.me, which has an enterprise value of $US9.5 billion, with the purpose of winning 50% market share in three year’s time. Alibaba announced earlier this month that it will partner Ele.me with Starbucks, to start delivering its coffee to customers in September. Alibaba believes the partnership will be a boon for both companies with plans to expand the delivery program to more than 2,000 Starbucks stores across 30 Chinese cities by the end of 2018. The company’s investments in new retail and Ele.me are “the right strategic investments” in the eyes of RBC analyst Mark Mahaney, who has an “outperform” rating and $US215 price target – almost 25% above where shares were trading Friday. “Alibaba’s healthy and stable core marketplace margin of 62% enables them higher flexibility to expand into larger addressable revenue opportunities beyond eCommerce into entertainment content and local services,” Jefferies analyst Karen Chan said in a note sent out to clients on Friday. “Given full-quarter consolidation of Ele.me, we expect FY2Q19 core commerce EBITA margin of 41%, -16pcpt YoY, with growth reaccelerating to 26% YoY in 2HFY19 vs. 19% in 1H upon anniversary effect from Cainiao consolidation and new retail,” said Chan, who believes these investments would enlarge addressable revenue opportunities although they may weigh on Alibaba’s net margin. Chan lowered her price target to $US225 from $US242, but maintained her “buy” rating. On Thursday, the e-ecommerce giant released its second-quarter results which showed revenue soared 61% year-over-year to 80.9 billion yuan, or about $US11.8 billion, slightly topping the 80.88 billion yuan that analysts surveyed by Bloomberg were expecting. 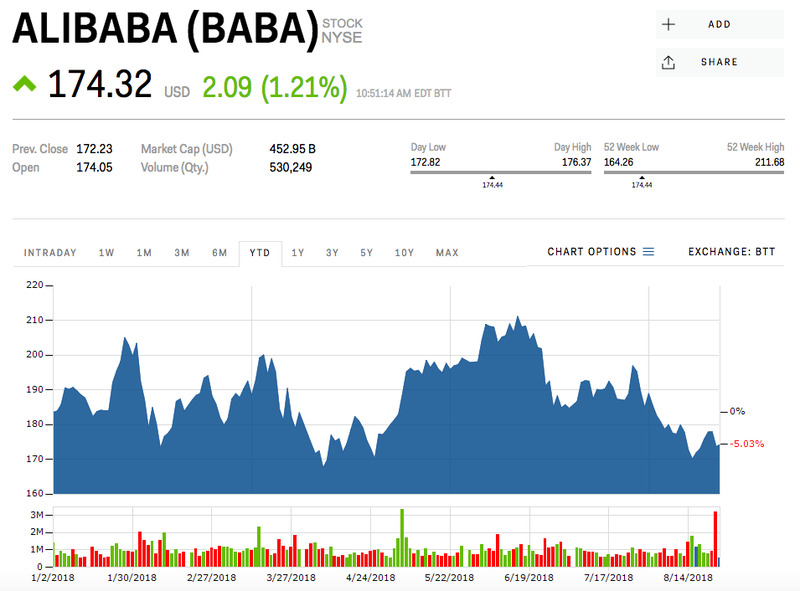 Alibaba shares were down 5% this year.